Smooth and velvety on one side, soft plush sherpa on the other side make this the cuddliest blanket of all time! 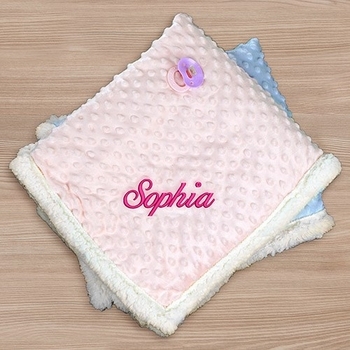 With baby's name embroidered in a corner, this sweet blanket makes for a thoughtful gift. The dimensions of the blanket are 30 inches by 40 inches. See More Images for a view of the block font (blue blanket) versus the script shown (pink blanket). Name can have a maximum of 12 characters, including spaces. Sweetest, softest blanket ever! Love it! ConsI might of gotten frustrated that the babies name didn't fit when I was filling out the order form. But you figured it out!